In “Memories” from her second studio album “Gemini,” 20-year-old Yoon Mi-rae, or Tasha, was all about overcoming hardships that came from being biracial in Korea and surviving in the hip-hop scene. Some 16 years later, the working mom with a 9-year-old son, now in her late 30s, is back with a new autobiographical album, “Gemini 2.” And instead of a stormy description of life’s struggles, she filled the 12-track collection with tales of married life, family, love and her status as an established artist. Yoon does a great job in pulling other genres into her hip-hop sound, which sounds more stable than her previous works. As if looking back at her youth, “Rap Queen,” the kicker of the self-reflective album, opens the album by playing up some concert-hall tune of “Memories,” which is soon taken over by Yoon’s fierce rapping about her bravado. R&B lead track “Thin Line” is a brilliant duo quip with her rapper husband Tiger JK, in which she shows her humorous side by dissing her husband in the most realistic style. “You are like a dog. You promised me to bring us a lot of money, but you drink and become a prick every day,” she raps. Tiger JK strikes back with love, trying to soothe his angry wife with some winsomeness. Yoon’s identity as a mother, or her life priority, is clear in “Cookie,” an adorable song dedicated to the couple’s son Jordan, in which she seamlessly meshes her tender vocals and solid rapping. “You are so special to me. Yes I love you, love you,” she sings. Love song “You and Me,” a double lead track featuring rapper Junoflo, is probably the trendiest track in the album, in which her emotional vocals blend smoothly with Junoflo’s rapping. For those who have been missing the fierce version of Yoon, the musician flaunts her quick-fire rapping skill in “KawiBawiBo” while delivering the message of women’s power and peace. It looks unbalanced at first, but the song has earworm potential. The piano-led “No Gravity” is an extension of her 2007 hit “Black Happiness,” the most emotional and beautiful track in the album. There are also English versions of “You & Me” and “Peach,” and they provide a completely pop-ish vibe with Yoon’s soulful English. The album definitely veers away from Yoon’s previous ferocity. 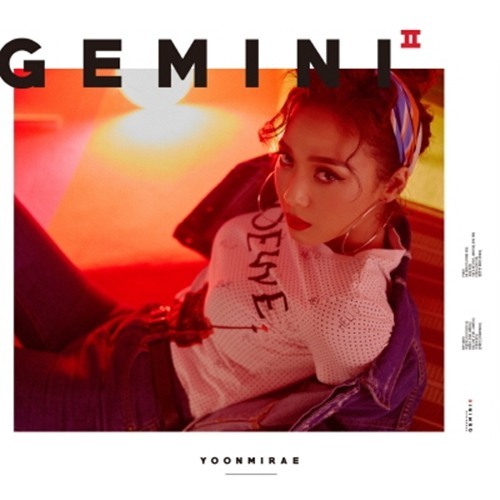 She is no longer our dear Tasha, but it’s good to see that “Gemini 2” overflows with love and warmth -- proof that Yoon belongs where she has to.